It’s time to hit the track in one of the raddest machines ever built. Slide the earplugs in, slip the head sock over your ears and pull the helmet on, fidgeting with it until it’s semi-comfortable on your giant noggin. Fumbling with the chin strap, your fingers finally suss out what goes through what clip and how to pull it secure. From the driver’s seat, everything looks as it should. Push the start button and the engine roars to life; it’s a noise that only the gods of war and thunder can fully appreciate. You give it a little gas and maneuver your vehicle up to the entrance of the track, following your ground guide to the starting line. Right now, you now have more power at your disposal than most humans have ever had access to. Watch for the “all clear” – and when it’s good to go, you give it hell. I’ve had moments like this in Dodge Challenger SRT® Hellcats, SRT Hellcat Redeyes and SRT Demons at ¼-mile dragways and full-road courses across the country. I’m guessing many of you have, too. Only this isn’t one of those times. This day, I was at work in Detroit. I was behind the “wheel” of the jet engine-powered, depleted uranium-defended, canon and machine gun-armed, tracked, 140,000-pound and 1,500-horsepower M1A2 Abrams tank. Most of my nine years at General Dynamics Land Systems (GDLS) has been spent fabricating military prototype vehicles and their parts, not driving them. 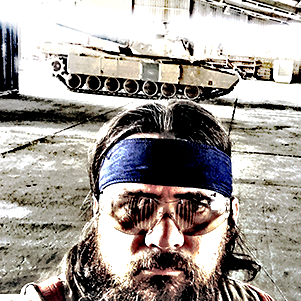 But I am technically a driver/mechanic, licensed to operate both the Abrams and Strykers platforms, and every now and then, I’m called on to run a vehicle for testing or even just to move it from one place to another in our complex. A few years back, I got a lot of seat time running an M1A2 to prepare for a trip to Abu Dhabi. The trip fell through, but it was a good experience and I put on a decent amount of laps around our track here behind the GDLS prototype shop. The Abrams is bonkers, and piloting one is as nuts as you’d imagine. But how does it stack up against putting the screws to a 707-horsepower Charger SRT Hellcat? They each have their strengths and weaknesses, and also a few surprising similarities. More Guns: Two 7.62 M240 coaxial machine guns; .50 cal M2 machine gun More Guns: Who are you, Vin Diesel? The smell of jet fuel never gets old. It’s one of the things I try not to take for granted, the cool factor of pulling into work past rows of tracked monsters. The M1A2 is an evolved beast. The original M1 was met with skepticism 40 years ago, but since then, it’s become increasingly advanced and lethal. From defense, tracking and communication systems to flat-out firepower, it continues to set the bar for combat tanks around the world. And while it takes a crew of four in the field and three (a driver and front and rear ground guides) just to move one around the shop, it’s surprisingly agile. With each side of the vehicle having wet disc braking integrated into the Allison trans, the 70-ton behemoth stops on a dime and pivot spins on a nickel. I’ve talked to some experienced drivers who’ve put the thing into controlled, looping 360-degree spins while moving forward in snow, and others who have drifted them on dirt and snow. The initial acceleration is surreal. For most of my life, I’d associated the sound of a giant turbine engine with the fighter jets I watched performing at air shows as a kid. They’d take off or fly by at insane rates of speed, and the noise they made was appropriately proportionate. Most modern American fighter jets have turbofan afterburner models of gas turbines. With the Abrams, it’s powered by a turboshaft version, where the turbine produces power for an output shaft, rather than creating thrust. The result is that when you put the tank into gear and twist the throttle, the AGT1500 spools up and sounds like an F16 Falcon about to launch into the sky. What actually happens is that 140,000 pounds of steel lurches forward with the clunk, clunk, clunk of the two tracks on either side of you. It took me a while to get used to separating the sound from the actual movement and to adjust throttle and brake application thusly. You’ll see a lot of different statistics thrown around regarding the Abrams, partly due to it being a platform that has undergone so much evolution since its debut four decades ago. Older versions were lighter (less armor and armament) and the turbine has been tuned and tweaked for efficiency and durability, amongst many other things. One number that is of particular interest is always the top speed. I’d always heard that while the M1 had a limited top speed of 40-45 mph, if you “took off the governor”, it could hit 70 mph pretty easily, at least on-road. The truth is that, while I’m certain some early Abrams did hit numbers near that when stripped of armor, it’s not just a matter of fuel efficiency or wear and tear on parts that keep the speeds down. One engineer told me, “The thing is, no humans could handle it for long. The forces exerted on their bodies, especially on tough terrain, would destroy them before too long.” This is a suspension meant for things other than grand touring. The Charger SRT Hellcat, on the other hand, has no such governor or requirement for one, unless “being awesome” needs to be limited. During high-speed testing on the track at Ohio’s Transportation Research Center, SRT engineer Erich Heuschele hit 206 in one direction and 202 in the other to validate an official top speed of 204 mph. On the street, it’s not a good idea to re-create such a feat, but it’s nice to know that if an alien invasion does come and an Abrams isn’t within reach, at least you can evade an attack quicker than most. Both can provide you with smoke for cover. The Charger SRT Hellcat is maybe the best burnout machine any car manufacturer has shot out of a factory, ever. Its long wheel base and 700+ hp keep it straight while turning asphalt and rubber into a white haze. The M1A2, however, is equipped with smoke grenade launchers on either side of the turret. The Charger has four doors with seating for five. The Abrams has three hatches with stations for four. The SRT Hellcat has 4.6” of ground clearance. The Abrams can drive over cars. The Charger has Laguna leather seats and trim. The Abrams has slightly padded yet very durable vinyl cushions on steel seats with CARC (Chemical Agent Resistant Coating) painted interior. The SRT Hellcat’s HEMI engine will run on 91 octane fuel, while the Abrams’ turbine will run on anything. Which is good, because it’s not gonna be easy to pull the beast up to a normal pump. Nor will it squeeze in a drive-thru without damage (not to the tank, but to the restaurant), so it’s best to pack a lunch. The SRT Hellcat will not only sidle up to your nearest Micky Ds without trouble, it’ll fit nicely into a single-car garage. The Abrams is almost exactly twice as long (32’), twice as wide (12’) and twice as tall (+8’) – just in case you needed to make measurements. But I wouldn’t head to your local lumberyard to start the garage addition project just yet. It’s not like I haven’t thought about seeing if GDLS has an employee purchase program. I ran the numbers on what payroll deduction would look like on a tank at its current price of ~$9m. At 84 months at 3.11% interest, we’d be looking at a monthly payment of $111,366. Now, say I got an employee discount and maybe a bit for trading in my SRT Demon and some incentives and talked them down to $8m and found a bank willing to give me a 99-year loan at the same interest rate, we’d wind up at a much more feasible $22,000/month, but that includes a total of $17m in interest. By comparison, a $68,000 Charger SRT Hellcat is a steal! Now, to bring it full circle: While GDLS produces the tank now, it was designed and first built under the Pentastar, just like the Dodge SRT Hellcats! In the late ’60s to early ’70s, the Pentagon was looking for a main battle tank replacement for the M60 (also built by the Chrysler Corporation). Chrysler Defense (along with General Motors, who later lost the bid) developed the gas turbine-powered XM815 prototype, which then became the XM1 in 1973. That designation remained throughout the R&D/prototype phases and through initial testing until it went into full-on production toward the end of 1981. No longer experimental, the Army dropped the X and it became the M1, or Abrams, named for the late General Creighton W. Abrams. In 1982, the military division of Chrysler was sold to General Dynamics, which designated their new arm as General Dynamics Land Systems. I work with a couple of guys who still remember being employed by the Chrysler Defense Corporation. They remember working at the old “tank plant”, which is now part of the Army’s Detroit Arsenal just a couple miles south, on the same road, of where I work now. It’s always fun for me to dip back into Detroit’s industrial history, especially in a case like this where my worlds collide. But this is just the beginning of my foray into Mopar®’s military might. Planes, bullets, engines, missiles, radar and space shuttles? Stay tuned!